And you thrive in it. These are gorgeous photos. this IS your element. and i will bug you til you have a show. you must have a show. in your city, showcasing your city. these make my heart beat a little faster. they make me wish i could tag along and watch you in your element… what i love is how no one seems to notice you shooting them, you truly are a fly on the wall and that makes them even more special. my 2 faves of this set are the man on the bike with his coffee in hand and then the man in the hat taken from behind.. that is timeless. love it. Thanks so much Kristin! I’m hoping to have a show by the end of the year…somewhere in this city! No idea the logistics…where, when, etc….but I’d really like to make it happen. I appreciate the encouragement! Yeah, I agree, they are timeless. I would like to suggest that you set yourself the challenge of an exhibition, but find a space that is as much about the subject matter as the images. Make it one that is accessible and reflective of the character of the city you live in, rather than just trying to find a gallery, hall, shop or traditional venue. Maybe if you had some place that would allow for a slideshow style opening, using the sides of buildings, but linked to a physical venue to see the actual prints? Street shots being shown in the street, with prints inside a venue? Anyway, keeping doing it, they’re good. Thanks sweet friend! NYC!!!!!!! Will you just pack me in your suitcase?! Please do photograph it…I’ll be eager to see your perspective! Beautiful photos … every single one. I’m isolated out here, like a country-bumpkin (quiet slow mornings) … your street views always make me miss those mornings in the city and all that urban energy (that you capture so well). Thanks Allison! Every area has it’s own rhythm doesn’t it? I always love your landscapes…. I can FEEL you city awakening. I’m quite far from any city now, but I remember those type of mornings. Philly was my city, and I entered womanhood there. I miss it sometimes. I loved that morning bustle that rose into the crescendo of a busy day. And you capture it all. I love the business man on the cell with the homeless person on the corner, excellent juxtaposition. I’ve been thinking of you this week as I prep a talk for my 3rd grader’s class on Dorthea Lange. She started out her documentary career with street shots of the breadlines. Like Kristin said of you, Lange became a master at shooting the people without being seen, or some historian said she had a presence that gained trust. I can see that in your images too. You’re making me all teary eyed. Thank you for the kind words Amy!! Oh and Dorothea Lange!! How I love her…. I’ve been through her books again and again….savoring. How I adore your city shots. I was in San Francisco this weekend with my camera and did think of you, the city shooter, and wonder what would Laura see among the hussle and bussle? I’m sure many tid bits and details that I glanced over. You have such a beautiful knack for this. It’s amazing how you capture so much movement in these still images. Wish I’d been with you!! Love San Fran!! What a fabulous city! Can’t wait to see what you captured! And thank you for the encouragement and sweet words! The one with the hat gets me every single time. I looked at it over and over again at work on my phone and couldn’t wait to get home and check it out on the actual screen. It should be blown up big and large and oggled daily. Just beautiful, Laura. What serendipity! I just posted a letter to you (sorry to spoil the surprise) in which I went on, at length, about your b&w street photography. And told you again, because it doesn’t hurt to hear it over and over, how very extraordinary it is. I’m with kristin – you MUST have a show – MUST! More people deserve to see these pictures. I’m a city girl too. I’ve logged miles on foot in Philadelphia, D.C. and New York and love the energy that I get as soon as my feet hit the pavement. These days my only time for real exploring city streets and alleyways (a personal favorite) is after my hair appointment every few months. Those few hours are so good for my soul, and I really hope that some day we can go off on a city explore together. I said it, I meant it: Hands down my favorite post to date. Your street work deserves a gallery. These are beautiful. You manage to capture the essence of a place that I’ve never been to. I feel like I have now though. Keep up the incredibly good work. I kept expecting to see a picture of Steve Reeves. Reblogged this on Harriett Monaghan. These are incredible street photos. They capture the essence of the city perfectly. Awesome post. Great pictures. I love the one with the man in the fedora. I’m so glad to see men still wearing those. Classic. Really sweet and classy photos! When I think of the city waking up, I think of the show STOMP, only less banging of cleaning supplies and more inclusion of everything else in a sort of rhythm. Your second last photograph is my favourite. The businessman with the cell phone at his ear looks less at ease than the homeless person gawking at him from across the street. Rhythm of the city, indeed! Wow, simply spectacular! I can tell you, I’ve “felt” the city this way before, during lunch breaks or even on my way into work down these very same streets, but I’ve never seen someone capture that feeling so lusciously and so gorgeously! Thank you from a fellow Houstonian! It’s actually Indianapolis!! LOL! Thank you for the kind words and enthusiasm! Lol! Well, love it just the same 🙂 Cities are cities, wherever they are. Keep taking stunning pictures please! Hey fellow street photographer! I definitely feel the pulse of the city. I especially enjoyed the one with the back-shot of the man in the hat. Love it! london is my city; i left nine months ago and return tomorrow. the streets are calling to me. Really beautiful. I notice how much alike beautiful cities look when you are getting great street shots. There is just something really perfect about hi-urban life! wonderful! thanks for sharing these, they tell a great story. look forward to seeing more. i have no doubt that in the future i will be walking through an art museum admiring your “early” work. i can’t wait for that day, because it is coming. Thanks for showing that I am not alone, and sharing these so beautiful realistic images ..
You have such an eye for the city! You capture her inhabitants with charm – the man on his bicycle is my favourite. Wonderful pictures… ia lot of poetry… I also love city streets, and now I’m living in São Paulo, which is a fascinating city! Very nice. You make the ordinary look interesting. Your photos kind of have a vintage feel to them. Where were these photos taken? Beautiful photography!! Thank you for sharing! these pictures are modern yet somehow old. Guess its just the black and white. I always enjoy black and white pictures. Nice shots! Interesting set of photos. The one I like the most is the second to last because it is a contrast in social status. I love this. What city are you in? Like someone else said, I don’t tend to be out and about that early, unless I have somewhere to be, and then I’m always rushing and not appreciative. When I was working full time before I came to University I always used to say I was going to get up at the usual time on my day off and get the same bus into town but the blissfully not have to go into work, and enjoy Derry, Ireland in the early morning. These are amazing shots. I particularly loved the dynamism of the second picture, with the vintage facades in the background and the lady quietly walking by. Everything about it is a character in a giant, never-ending play. It honestly reminded me of Breathless and Goddard. Very nice! I love this post. You made me look around and actually see. Love that! Aaah! You have a beautiful city. Unfortunately, I’ll just end up with a migraine if I do what you do in my city. Sigh! Amazing images. This makes me want to go out and capture my city. I love too city streets. I live on a farm in a rural community – so I’m rarely in a city. Your photos are super real feeling – though they are black and white photographs they still remind me of how 19th century painters captured their own communities. Your pictures are riveting. Thank you for taking them and sharing! Love all the coffee and vacant space. I can hear the city’s quietness. 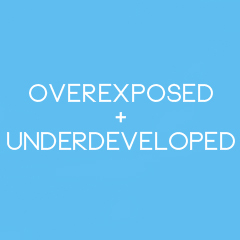 I just came across Overexposed+Underdeveloped and read the bios. Women who like bourbon, I came to the right place. I actually don’t like being in the city much unless it is one I am not often at. I do like to watch how people work and how the city runs from a far though. Great pics … and I love city centers! Nice photos and amazingly I felt like I was right there!! You were able to capture the flavor of the city and transported the readers there – without us having to leaving our own couch. Kinda like Star Trek with out the pointed ears and bad costumes. Congrats on being Freshly Captured, oops, I mean Freshly Pressed. These pictures are amazing and I really love the snippet at the beginning. Great post ! these shots are great. really impressive street photography. especially like the black and white. nice job! been wanting to do a post about the same topic but through words (am an idiot camera-wise). your post just gave me ideas, thanks. Thank you for the kind words and encouragement!! It’s actually Indianapolis, but I love that you thought it was NYC….my other love! Very beautiful pictures. It really makes you feel like a tourist! Wonderful photos! I just love seeing a city in the morning; everyone seems to be in their natural, pre-coffee’d element. You can tell a lot about a person from the way they scurry (or amble) to work to their reaction to a coffee-induced burn on their hand. There’s so much to love about a raw city. I feel like I’m in a Film Noir. Beautiful. Who said romantic photos were the sole domain of Paris? Fantastic photos , i’d love to tell you about the rhythm of my city ; melbourne . I wish i could take photos as good as yours , did you use any particular settings? just black & white ? what city is yours ? Reblogged this on Paper Mantis. I’m really impressed with these photographs. I wish I were braver with street photography. I’m always worried that someone will take offense at me taking pictures. These are so simple yet charming, and your short introduction summarizes how much you love the city at a particular moment in time. Truth to tell I like your photographs because your style in this series hints at the profound behind the everyday. Thank you for sharing! Photos are full with passion and inspiration! What beautiful photos! I’m a city girl too – I grew up in London and now live in Paris. I love watching my neighbourhood wake up as I walk to work in the mornings. Your shots are so elegant in black and white, and yet you’ve captured all the warmth of a colour photograph. I can’t wait to see more! It’s good to see that someone has managed to effectively capture the atmosphere of the city as it stirs into motion in the mornings. i really feel soul of city streets!!! it’s so amazing! wonderful street photography work, I like it!. Loving the photos. Great worl. Beautiful, love the B & W, and it’s nice to see cities have their own way of stretching and yawning awake. Congrats on FP. Really Great blog and amazing photography. I too have a love affair with the city – and somehow, black and white is the way. Thank you! Lovely photos, I especially love the one with the man dressing his coffee! Your very talented! All your pictures are lovely. I especially like the man sitting by the Starbucks window. Hope you have a great weekend and congrats on being Freshly Pressed! Throw my voice in the pile saying this is unbelievably amazing. Can’t wait to see more. Loving the tones and contrast. Your use of space in your compositions really put across that sense of early morning; before the madness of the day! Reblogged this on My Black&WhiteBoard. To be honest, I like black and white pictures better, because it’s classic. These are really nice. It’s the first time I stumble across this blog. The text and the photos. Which city is it you are talking about? Really great photos, a really respectful way to pay homage to your city. I agree that mornings are one of the best times to take pictures. Every morning I’m tempted to bring my camera on the metro with me on my way to work. In my current city, Madrid, where the nightlife can go on until 7-8AM, Friday mornings become a perfect time to capture a range of contrasts. People heading towards the morning metro to work rushing past universities students on their way to their beds, for example. Your photos have a real sense of place. Thanks for sharing! Fantastic set of images!! Both in technical quality as by the stories that they narrate. These are fantastic. And your introduction is clever and to the point–very apt. You have that special quality of a perspective introspect, at least in the early hours of the morning! Keep persisting at this. This could be very rewarding. What city were these photos taken? Wonderful pictures! I remember Henri Cartier Bresson in Paris. It ist really digital or analog black and white picture? I love big city life. These pictures remind me of how much life and culture there is in the world. Truly eye opening to see what seems to be the whole world coming to life. I’m gonna try this in Honolulu and take pictures. Great pictures! You made a big fan. Photos like these make me want to whip out my camera. Then I’m reminded that my camera is often my crappy iPod one, and that sadly, I am no photographer. Beautiful pictures! These photos are gorgeous, it’s wonderful how through the camera lense you can capture the moment in a very stylish way. I LOVE this post! So atmospheric, and the black and white shots make them look like they could have been taken 50 years ago. Good eye for the photo. Great focus and depth of field. I live in Port Hope, Ontario, Canada, a small historic town, and I do similar photos you can see on my Facebook.Thanks you for sharing these with the world, they are beautiful. Very neat! The black and white is perfect and the way you took them is so urban and modern yet edgy. Reblogged this on Leave Some Morphine At The Door. These shots are fantastically atmospheric – awesome! Beautiful pictures. I live in a little city not as stunning as yours but i love it anyway. You capture the rhythm very well. Beautiful! What I like here, and I am totally new to this blog world, is that some care and effort have been made to share something important and in an artful way, to their world which is quite different from mine. Beautifully captured. What city is this? If you don’t mind my asking. Absolutely great photos. -Seriously.. good work. Nice work, and well presented. Well done. Thank you for being you. Great job! Oh… I love these photos….. love, love, love!!!! Good perspective on your city. I live in the country and I wake up to chickens, cows, my dogs, and sometimes stray animals like deer in my yard. I use to live near Washington DC when I was in grad school, I remember what it was like to wake up with the city. Wow these pictures are really nice! Your photos are beautiful. Black and white photos are always such a charm, and you do it so well! I love observing the streets as well, that is one of the most precious thing one can take from travelling. Great shots – I love photographing city life too, there’s something really unique about it. What camera/lens combo did you use for these? I like the monochrome setting so much! It makes the whole composition look so tranquil and mellow. This is a very nice blog, energetic, unique and the photos are very good! Mornings are my favorite time of day for the reasons you noted and captured. Something about the world waking up. The city breathes. I love your philosophy. My life is enriched by being a flaneur. Even more so be being a flaneur with a camera. do you shoot film or digital?? This is the image of the City i’ve always wanted to live there for. Sometimes, when I’m there, I catch a glimpse of it like this, as you have. Thank you. I like your photos. very much. I live in a big town/small city, so it will be different than your photos, but I’ll give it a go. Sometimes when I’m out of the house, I see certain things that I get the urge to photo… but I have no camera on me. But your photos look so elegant, even though they are fairly ordinary. Makes me picture most of my imagined photos in black and white. Even though some are just more suited in colour, I really do appreciate the elegance here. The way you captured ordinary life and made it look interesting was magical. Spectacular! Glad this was freshly pressed and being an amateur photographer myself will surely take inspiration from these photographs and try them:) And which camera btw? Beautiful city. Beautiful photos. And somehow you manage to make it look like you’ve stepped back an era. Super! I really love your pictures; they are the future history books and will help others understand what day to day life was like and the beauty of moments. Brilliant. Beautifully captured moments. I love black and white photography.